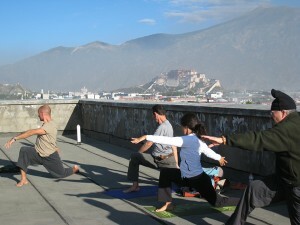 This trip includes spiritual, cultural and geographical exploration of Tibet while also practicing yoga. We visit Lhasa, the holy city and see the ancient cultural and spiritual sites; explore country side, spend time with nomads and spiritual masters in far remote area where modernization has not yet touched; witness the last remaining of an ancient spiritual civilization and struggle of people to preserve it. As every participants of our trips say, it is a once in a lifetime experience. So, join us. You will never forget your experience. Saturday, July 17 (remember you lose a day when flying to Asia, so you must have left home a day before, on Friday). Arrive and stay one night in Beijing and meet the tour leader and other members of the group. We fly to Lhasa over the most spectacular views of majestic snow mountains and giant rivers that cut through the Tibetan Plateau right beneath our eyes. In Lhasa we check in to a Tibetan hotel in the Tibetan quarter, very close to the Jokhang Temple. Tonight over tea on the rooftop restaurant of the hotel, we discussion about Tibetan culture and customs. After morning yoga and breakfast, we visit Jokhang Temple, built in the 7th century, the Jokhang is the spiritual heart of Tibetan Buddhism. Pilgrims from all over Tibet gather, walking with prayer beads and prayer wheels in their hands, focusing only on a good rebirth and achieving enlightenment. In each of Jokhang’s 30 chapel has different statues of Buddhas, deities, lamas and protectors that have been collected between 639 and 1959. The central chapel houses Jowo, a 2,500 year-old statue of the Buddha brought to Tibet 1,300 years ago, surrounded by priceless jewelry embedded in the pillars. Pilgrims touch their forehead to the knees of Jowo and pray for their heart’s desire. The walls are covered with murals depicting the history of Tibet and of Buddhism, including the construction of the Jokhang Temple itself. After exploring the chapels and statues, we visit the roof of Jokhang where we see thousands of pilgrims and residents of Lhasa circumambulating beneath us. Our spiritually stimulating afternoon includes exploring the Barkor, a sacred circumambulation route around Jokhang Temple, which is also a marketplace and has many temples and galleries around every corner. 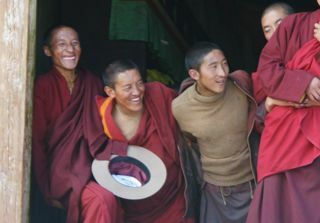 We share this deep sense of spiritual experience with thousands of Tibetan pilgrims who come here from hundreds of miles away, sometimes by foot or by prostrating, to cultivate good karma. Today we explore the landmark of Lhasa and an architectural wonder of the East. The Potala Palace is built high on a hill called Marpori located in the center of Lhasa city.The palace’s 13 stories, built entirely of mud and wood, contain 1000 chapels. There are gold-embossed tombs of past Dalai Lamas, one of which is called Zamling Yeshag (equilvalent in value to the entire world) because of the amount of gold, precious gems, and countless artifacts contained in the tomb. 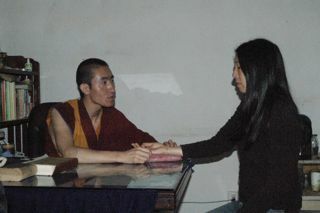 In the afternoon, we visit a traditional Tibetan doctor who introduce us basic Tibetan medicine history and practice. As our bodies are still working hard to adjust the time and climate, we devote some time in the afternoon to resting. In the evening we visit Tenzin’s family and have dinner with them. This morning we take our pilgrimage to the Drepung Monastery, historicaly the largest monastery in Tibet. Our tour includes a visit to the Dalai Lama’s first palace and the Great Hall that once held 10,000 monks. Drepung was relatively less destroyed during the Cultural Revolution and therefore possesses more relics. This is also an opportunity to meet some inspiring nuns who have been meditating in a cave near the monastery for many years. In the afternoon, we visit Sera Monastery and see the monks debate. Today we depart Lhasa and visit Ganden Monastery, the seat of the founder of the Gelugpa sect of Tibetan Buddhism. After our lunch at the monastery restaurant we set foot into the temples of the most important monastery in the Gelugpa school of Tibetan Buddhism. The temples we visit include; the tomb of Tsongkapa and the Throne of Ganden, the Great Hall of Ganden Monastery, and Ganden Tsogchen, where monks perform prayers. Then we follow a traditional pilgrim route around Ganden, known as Ganden kora. In afternoon, we continue our journey to Terdrum. 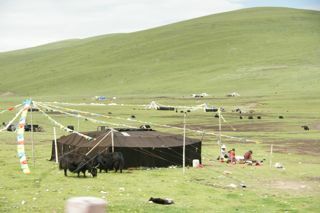 We camp near by the nunnery, do our yoga in this beautiful valley with sacred history and take bath in the natural hot spring that Tibetans believe to be medicinal spring that cures many type of diseases as it was blessed by the Guru Rimpoche. In the morning we hike up to the mountain to visit hermits and meditation caves. One hermit has not spoken for the last twenty-five years, as he believes that so much of his life was wasted by idle talk. 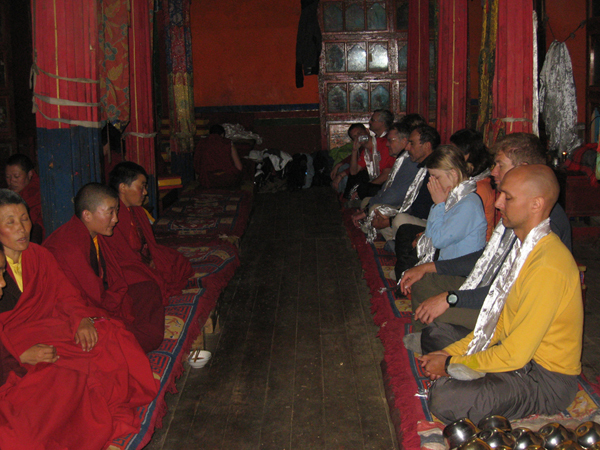 Despite this vow of silence, he welcomes Tashi Delek Travel’s guests to his hermitage and will make us a simple healthy lunch. 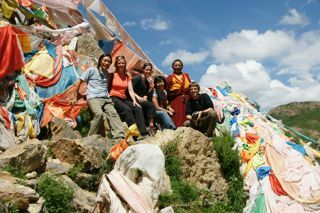 In the afternoon, we visit the sky burial location at the Dregung Monastery, 9 kilometers from our camp. The monastery is the first and most important monastery ever built for the Dregung Kagyu sect of Tibetan Buddhism. Renowned for its Tantric practice and sacred sky burial, it is believed that those whose bodies are taken here won’t be reborn in the lower realm of cyclic existence. Here on a wooden board, all—rich and poor, powerful and powerless, old and young, men and women—disappear. We may even see vultures still flying around the sky above and crows picking up undetectable pieces from the ground. 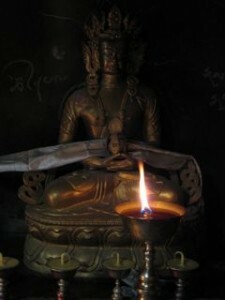 In Buddhism, the body is a temporary “guest house” for the spirit that journeys forever within the six realms of existence until it becomes enlightened. 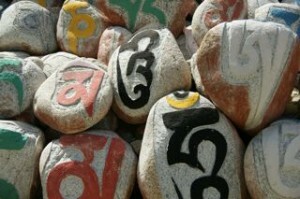 Tibetans believe that giving their bodies to birds, as opposed to being buried or burned, makes use of a useless body. After this visit, we return to Terdrum to experience the hot spring once more prior to a yoga practice. 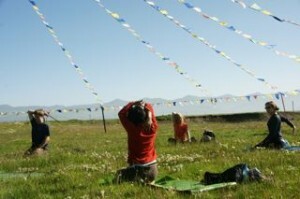 As the sacred mountain peaks behind the hermitages, stars glow like milting gold, we breathe our morning yoga. Today we continue our journey through breathtaking view of remote high mountains valleys where Tibetan farmers weed their green barley paddies, and nomad children wave us welcomingly. We have lunch on a green meadow by the large river that soon becomes the Lhasa River, and practice yoga before continue to Rading Monastery. Tonight we camp below the Rading Monastery. Rading Monastery is located in a remote place surrounded by juniper trees in a region that otherwise treeless. The monastery was originally built in 1056 by Drom Tonpa, one of the most important historical Buddhist teachers in Tibet. The main lama of the monastery is Rading Rinpoche who once was a teacher and regent of the Dalai Lama. Today, being only 11 years old, the lama may receive us in his “palace” and bless each of us a touch of his sacred textbook on our heads. We meander through temples in the monastery, and hike up through the juniper trees to the cave where the most famous Buddist text in Tibet was composed by Tsongkapa, the Lamarim—Stages of the Path to Enlightenment. Today we arrive at our final excursion outside Lhasa, Namtso Lake, the second largest lake in the Tibetan Plateau and one of the most sacred sites for pilgrims and home of the hermits. 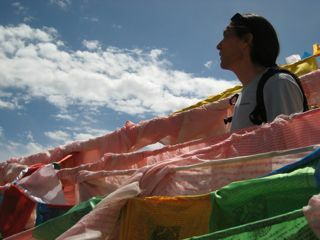 The first sight of Namtso Lake from a pass full of colorful prayer flags literally takes your breath away. We are now at 15,000 ft. We camp by the lake with nomads as our neighbors. Here we meditate along the edge of the lake to experience first hand the peace and tranquility of this place. The old nomads here tell us that they often see dragons flying in and out of the lake. The night may just bring some great excitement! If you haven’t been here before, then it is probably the first time you will discover just how many stars exist in our universe. Bring your camera and stargazing map! 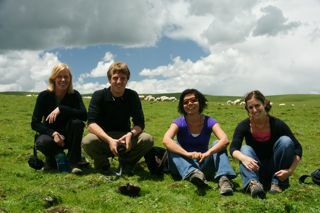 After our morning meditation/yoga in this spot of once in a lifetime opportunity, and visit some nomads to share tea with. We return to Lhasa in the evening, check in to our hotel and take hot shower! We have a relaxing afternoon in Lhasa at the House of Shambala, drinking their famous Indian masala tea on the roof, practicing yoga in their studio and seeing the sunset and moon rise. Today we leave early to drive to the world’s highest mountain, the Jomo Longma (Everest). It is a day-long drive via Shikatse (also Shigatse) where we have lunch. Driving through many scenic mountains and valleys, we spend one night below Jomo Longma (Everest) at a monastery. As the crown of the earth gets sunlight, we drive up towards it, to the famous Everest Base Camp, 17,000 ft above sea level. Here, we set our feet on the mountain that every mountaineer dreams challenge with , we spend our morning. If our strength permits, we may do little hiking. In the afternoon, we drive to Shikatse. After we visit the Tashi Lhunpo Monastery in Shikatse, the seat of the Panchen Lama, second only to the Dalai Lama. We then drive back to Lhasa and with a rest break at the gorgeous lake Yamdrog Yutso. End Trip. Depart from Chengdu on Saturday, August 1, OR Depart for your next adventure! If you would like assistance planning additional trips please let us know and we can connect you to the appropriate travel agents in Chengdu. Yoga practice is a part of this trip. Some of our clients call it the “cream of all experience.” However, because of the high altitude in Tibet, you must not expect this is going to be the same as the typical yoga retreats at the sea level where you do one and half hour yoga twice a day. It takes several days to get acclimatized to the altitude in Tibet, let alone any physical activities. We consider this trip more spiritual yoga rather than physical yoga.